Receive access to our most updated interstate highway information through our website and on your Apple® iPhone/iPad or Android® device. 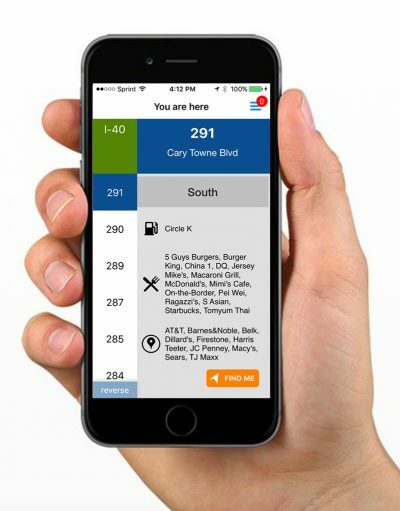 Quickly find the nearest gas, food, hotels, camping, shopping, and more. Know what’s coming up at future exits as you drive the interstate highways! Prefer a book in your hands? We literally wrote the book on interstate highway travel. 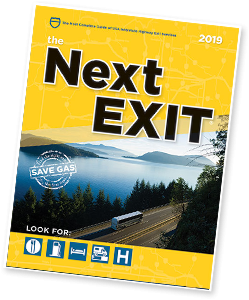 In our 512-page paperback directory, you'll find exit-by-exit listings of the services you need while traveling the USA interstate highways including gas, food, lodging, camping, shopping, and more. Get your hands on the most accurate and complete exit guide ever printed and never take the wrong exit again! the Next EXIT® is the most complete and accurate composition of U.S. Interstate Highway exit services available. You’ll find a thorough exit-by-exit listing of every service you will need while traveling: gas, food, lodging, camping, shopping, and much more. This “Exit Bible” will enhance your traveling experience. Now you can know what is ahead before you get there, and you will never take the wrong exit again with the Next EXIT®! Ever wonder how we do it? We have been physically identifying and recording the location of every gas station, restaurant, and hotel at every Interstate Highway exit in the contiguous United States for 30 years, averaging 35k miles each year. If math isn't your thing, that's over one million miles and counting to keep your information hyper-accurate. So yeah, we know where stuff is. How many times have you passed an exit on the interstate highway, only to realize that you missed that gas station you were looking for? Have you taken the wrong exit, only to be disappointed at the selection of services there? Have you settled for a motel or used the restroom in a less than desirable location? Developed for over three decades, and updated regularly, this “Exit Bible” puts the power in your hands! "Just a short, but sincere note of thanks..."
"...to you for publishing the most valuable travel book there is. I drive 25,000 to 30,000 miles each year. I know what I'm writing about. Keep up the great work." "We love your travel guide..."
"...the Next EXIT and never leave home without it. It is especially helpful for us during times of high gas prices. Indispensable for us during long vacation times." "I have enjoyed my copies of the Next EXIT immensely when traveling. It is the perfect gift for a fellow traveler." "I'd be lost without this book. It is very handy...well worth the money."